I recently met Dr. Elena Chelysheva when I was in the Mara over Easter. She has been running a research project on the cheetahs of the Mara since 2001 and has established a great database in that time. 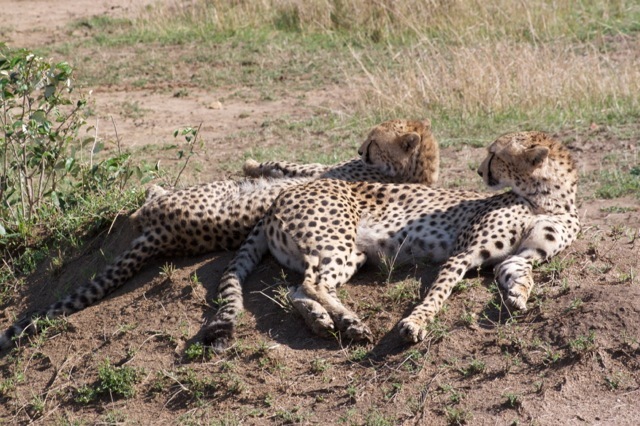 If anyone has photos of cheetahs taken in the Mara over the last 15 years, and is willing to share them on this post, her research would be greatly enhanced. I will start off by posting a photo of Bawa, the son of Malaika taken in June 2013. What a cutie! Does the name mean anything in Swahili? It's what we call Parsis in India. Thanks Dhruv. How did I not know about this? And we can play at identifying @@Atravelynn...... My first guess would be Female N15, but I could well be mistaken. Bawa I think means wing in Swahili, son of Malaika meaning angel. Of course, we named our filly Malaika and she's turned out to be a bit of a devil. Devil being Shaitani in Swahili. I once bred a colt who I named Shaitani and he died as a 6 month old from a broken neck. How's that for lots of useless information. Twaffle - you are right, Bawa means wing. He is just over a year old now and from looking scruffy a couple of months ago he is growing up to be a beautiful, relaxed male cheetah. He usually eats the 'lions' share of Malaika's kills hence she sometimes has to kill twice in a day - the first kill being for Bawa! Interesting thing about the Mara cheetahs is the amount of territory they cover. They are most definitely not territorial. Malaika and Bawa for example just in the last few months have been seen as far west as Musiara Marsh, south down to Lookout Hill and two days ago they were seen moving east not far from Keekorok. That pretty much covers 80% of the Narok side of the park. Malaika is F15 on the ID scale. She is pretty much the most approachable cheetah I have come across. 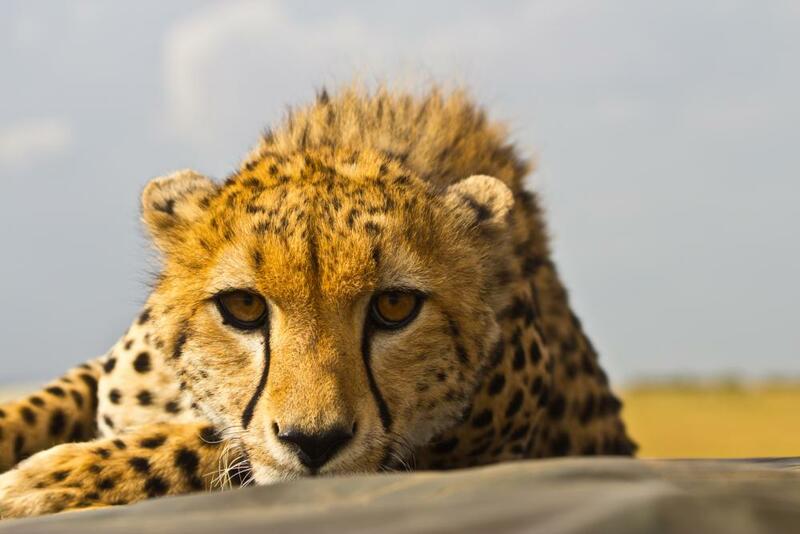 I urge anyone that has been to the Mara and photographed cheetahs to contribute to this thread. 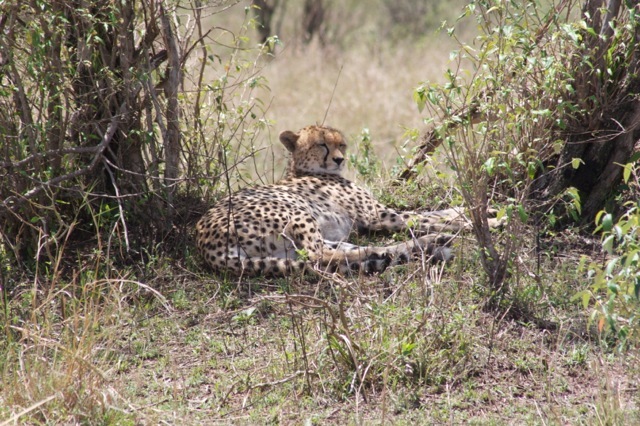 In addition to helping with the research you will get some amazing information from Dr. Elena on the history of that cheetah - and who knows you may just identify one outside of her current set which will be exciting. A lovely photo of Amani and two of her 3 cubs taken by my guide at Mara Intrepids last month. Amani is the daughter of Saba and I have photographed her as a small cub in April 2010. This is her first litter and she has done an amazing job raising them to their current age of c. 10 months. They too roam a vast home range - the cubs were born near Lookout Hill and have moved into the Northern Serengeti at various times. Right now they are in the OOC which is North of the Reserve. The cubs are very cheeky too and often climb onto cars although the mother has never done so. For a period of time in March and April, Amani and Malaika's families lived very close to each other and you could often find them within a kilometer of each other. 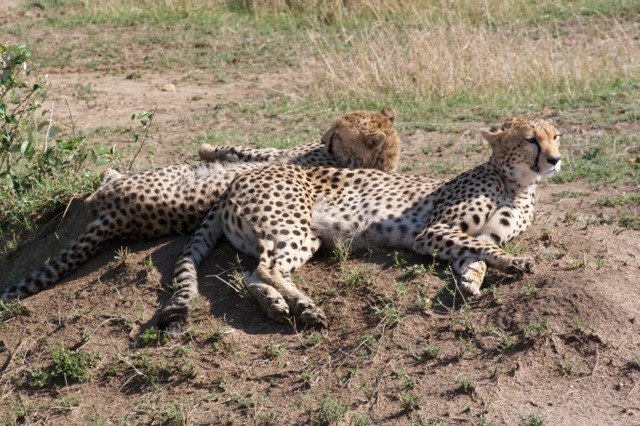 Could it be that Amanis cubs learnt from watching other cheetahs? When posting photos do we need to include the approximate location/date taken and if known the cheetah's name? I would recommend you submit the photos of Honey's Boys too. Even a part of a leg can ID the animal. They are well photographed so it should be possible to ID them. And there are probably photos of them taken before and after your photos. However, your photos would mean and another entry in the survival database, which would make the model predicting if an animal is alive or not, which will improve any population models and estimates, better. You can estimate much better if an animal alive or not if the animal has been seen every two weeks between Jan 01, 2007 and Jan 01, 2013 than when you only saw it Jan 01, 2007 and Jan 01, 2013. And that in turn will increse the accuracy of population models and estimate. So any photo will help! any photos will help. Having spoken to the researchers, surprisingly it's not the facial spots that they use for identification, it's the front thighs and the tails. We just landed and this guy was there to welcome us to our first visit to the Triangle. He did such a great job we've been back every year since! June 2010 next to the Kichwa Tembo airstrip. June 2010 - at the base of the Oloololo escarpment about a mile south of the gate. June 2011 - at the base of the escarpment also a mile or two south of the gate. We spent some quality cheetah time with this cat. Absolutely magnificent and was just radiant. June 2012 - in the triangle (I can't remember exactly where)! Last one as I haven't uploaded pictures from our January 2013 visit yet. This was quite a nice way to start a Friday morning - flipping through some old galleries with a cup of coffee. Now off to work so that I can save for the next trip! So lovely to see little Bawa and somewhat bigger Bawa...he does look angelic. Wonderful photos; gave me Mara lust for sure!!!! I think I have some from our 2010 visit to Serian; so will dig them out and TRY again to post them. I love the one with the cheetah and the wildebeest.